Before proceeding with the installation, the installer will perform system configuration check to determine if all prerequisite software is available on the machine. 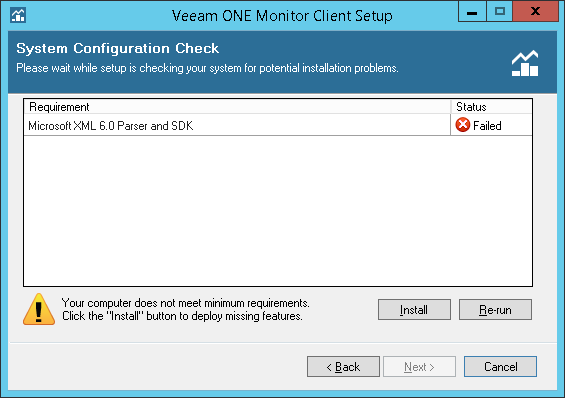 To learn what software is required for Veeam ONE installation, see System Requirements. If some of the required software components are missing, the setup wizard will offer you to install the missing software components and enable missing features automatically. To install the missing software components and enable missing features automatically, click the Install button. You can cancel automatic software installation. In this case, you must install the missing software components and enable missing features manually (otherwise, you will not be able to proceed to the next step of the setup wizard). After you install and enable all required software components, click Re-run to repeat the system configuration check.